GLENDALE, Ariz. — The Packers and Cardinals were scoreless following one quarter of play today, but the Cardinals were at the Packers 10-yard line when the quarter ended. Arizona won the toss and elected to receive. The Packers defense forced a three-and-out and following a Cardinals punt, the Packers had the ball at their 40-yard line. Aaron Rodgers threw to James Jones for a first down at the Cardinals 46. On third-and-3, Rodgers threw for a first down, but Josh Sitton was flagged for holding. Rodgers’ pass for Davante Adams on third-and-13 was incomplete, forcing a Tim Masthay punt that was downed at the Cardinals 5. Carson Palmer pitched a short pass to David Johnson, who broke three tackles en route to a 44-yard gain to the Packers 35. On third-and-4, Palmer was sacked by Mike Neal, forcing a punt that was downed on the Packers 4. 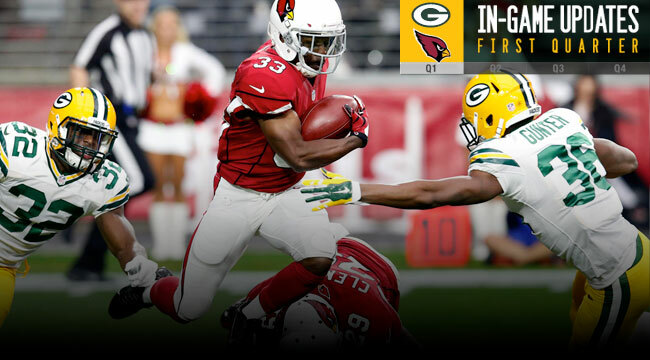 The Cardinals took possession at the 50 following a punt and a facemask penalty against the Packers.